You move slowly through the Necromancer’s dungeon, carefully peering around every corner and treading as deftly as you can manage so as not to make a sound. The paladin, weighed down by full plate armour and a sword larger than the party’s halfling, trips on a discarded candelabra. The clattering noise echoes off the carved stone walls, answered by the hiss of evil, several green glowing eyes staring at you in the dark and a hulking beast made of sewn together body parts lumbers towards you. “Roll for Initiative!” The Dungeon Master cries, to be answered by a cacophony of tactical questions; “How far away is the hulking beast?”, “Can I see the Necromancer?” And “if I cast fireball, how many bad guys can I hit?”. 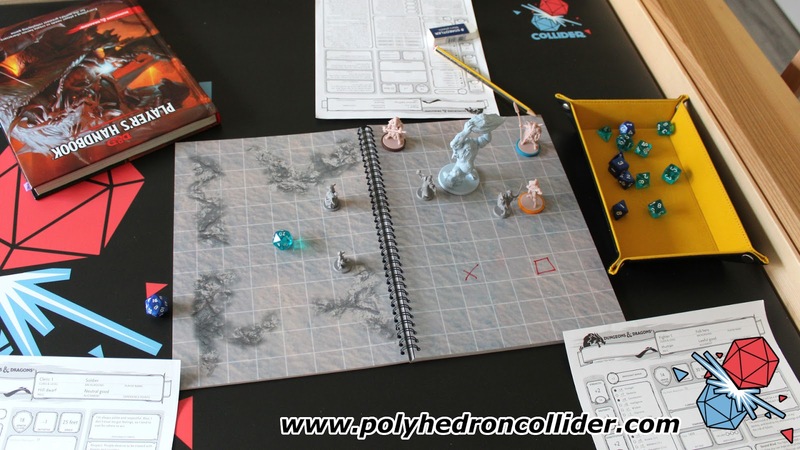 Whilst I respect anyone who can run a theatre of the mind game, its these questions that means, for me, a tactical miniature grid is the best way to play Dungeons and Dragons or Pathfinder (or any other table top miniatures game that requires tactical combat). There are many ways to skin this particular displacer beast. One could purchase the entire range of official D&D map tiles, which of course Andy has done at no small expense. You could go to great lengths to place a monitor in your table and use Roll20 or Fantasy Grounds, or you could take my low-cost approach and just use an old piece of Perspex and some dry erase markers. 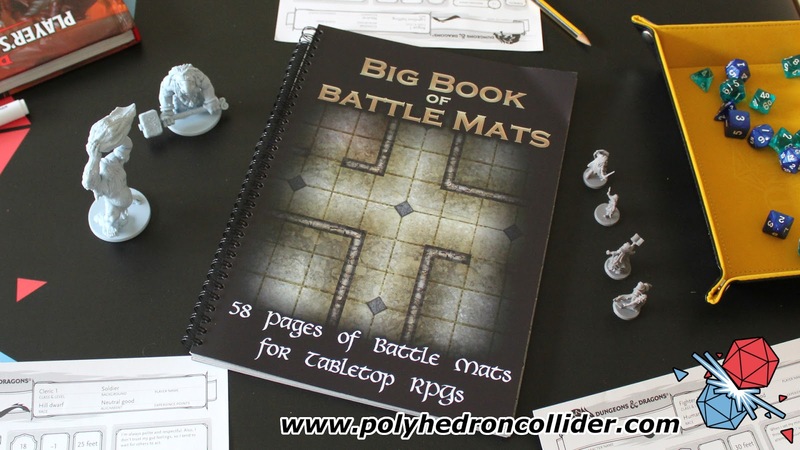 Or you could use The Big Book of Battlemats. This book contains a plethora of fantasy themed locales; deserts and frozen tundra, woodlands and mountains, and enough dungeons to please a 50 Shades of Grey fan convention. A Volume 2 is on its way next year, as is a science fiction version, though many of the wilderness locales could be used in any setting. Dr Who got away with using an old quarry in South Wales for any old planet. The book is ring bound so easily lays flat on the table and each page is gridded and protected by a durable coating. 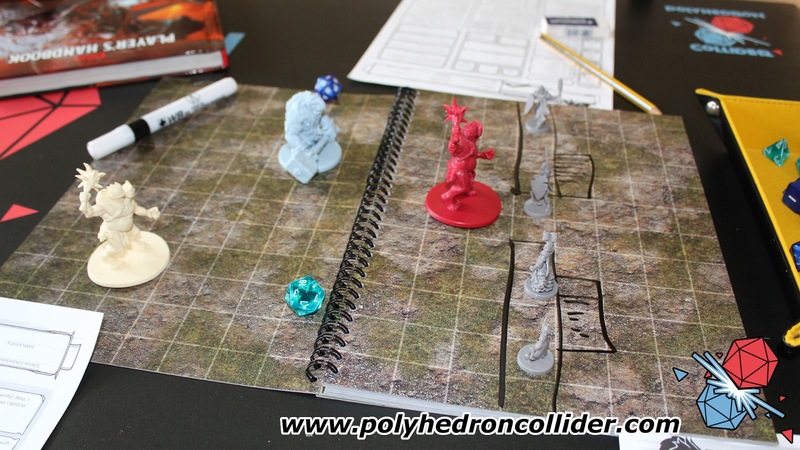 This means that not only can you annotate your map with some dry erase markers, but they can easily be wiped clean and have survived an encounter with the dreaded kitchen cleaner spray (CR13 if you’re wondering). This is especially handy if the map isn’t quite what you’re after, so if you want to add doors, fortification, collapsed tunnels and what not, you’re only a dry erase marker away from making your favourite death trap. Sorry, did I say death trap? I meant exciting locale for high adventure. Each double page comprises of a 16 x 12 grid, so at your typical 5 feet for square you’re going to 80 feet by 60 feet to play with. In most games this is going to be plenty to use, and for most small to medium encounters is going to be more than enough. I, however, am currently running Wizards of the Coast’s Storm Kings Thunder, a D&D campaign that involves a lot of fights with giants. For these encounters I found the area just a bit too small, mainly because my players’ favourite strategy is to run away while casually peppering the giants with ranged attacks. To be fair, its only these epic fights against multiple huge enemies where I find the scale lacking, for most fights I found the scale actually deceptive, in that I had more room to run the fight than I first thought. Overall I am very impressed with The Big Book of Battlemats. It’s well presented, well drawn and the quality of the pages is substantial. Whether you’re new to table top role playing game newbie or a seasoned dice chucker, there’s something inherently useful about this book. 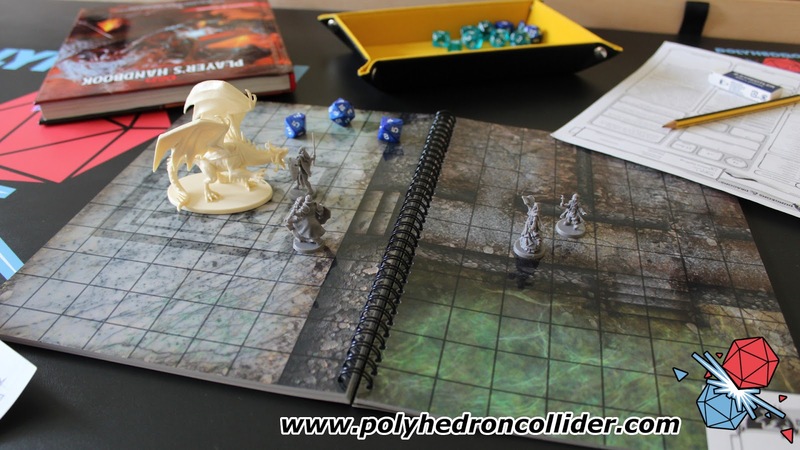 It’s great for getting a battle to the table quickly, especially when you have an encounter the Dungeon Master wasn’t intending, when the players invariably depart from your carefully written plot to chase down some minor aspect of the story. The Big Book of Battlemats is available a from Loke Battle Mats.